Houses & Homes VA: Increase the Curb Appeal of Your home for $100 or Less – I Promise! Increase the Curb Appeal of Your home for $100 or Less – I Promise! I could not believe it! I had no idea just how fantastic I could make my sidewalks and the concrete around my home look until I had seen it for myself. This is one of those DIY projects that almost anyone can do and the results are AMAZING! In just a couple of days you can increase the curb appeal of your home 10 fold and it requires nothing more than stain and a clear sealer. If you can paint, you can do this! Before you get started with the fun you will definitely need to clean the area that you intend to stain. Use a broom to sweep away any debris. Next get yourself a stiff metal brush and remove any dirt and grime that is in the cracks. Finally some good old fashioned soap and water and a scrub brush will give the entire surface a good cleaning. This is an important step, dirt or stains could show through the finish when you are done and that would not be good. 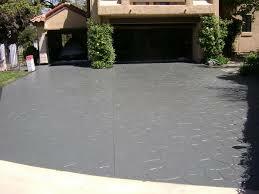 If you need to use a concrete stain remover than take the time to do it. A good hose down when you’re done will finish step 1 and now just let it dry! This is the fun part! How to decide which color stain you want is up to you. If the concrete is new (6 months or less) than it’s OK to use water based stain but otherwise you will want acid based. This will give you the best results. Be sure to wear a face mask and gloves in either case. Make sure that you mix the stain well and just pour it into a standard paint tray. You can use an everyday paint roller to apply it and be sure to completely saturate the concrete – that includes the cracks. When you’re done you will want to protect the stain while it is drying. I suggest using a tarp or even those large heavy duty trash bags that you can buy at the store. ANYTHING that gets on the wet stain is there to stay so this is a necessity. You could use rocks, bricks or anything that you have available to hold the tarp (or bags) down at the edges. You want the stain to dry completely and I recommend at least 24 hours drying time. If it feels “sticky” to the touch it’s not done yet. If a second coat is required than that’s fine, if not then it’s time to apply the clear sealer. Use the same method here as you did for the stain. This is when the stain really “comes to life”. That beautiful shine will be the envy of the neighborhood and your home just became a lot more appealing!